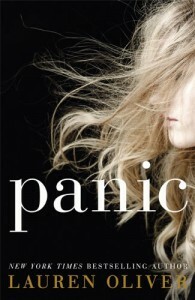 Lauren Oliver's Panic is right up there with James Treadwell's Advent when it comes to beautiful YA fiction. Although they're completely different in terms of plot, they both share that dreamlike quality to the writing, and the feeling that with just a tiny shift upwards in the age of the protagonists they'd make equally beautiful adult fiction. There's no dumbing down, no abundance of irritating slang or cop-out plot lines, just intelligently written, compelling characters that will have you up all night. Dodge's plight is so believable, Heather and Lilly's home life will tug at your heart strings, Bishop will take you by surprise and you will learn how to make napalm. If that isn't reason enough to pre-order this one, I don't know what is! I now need to go and order everything else Oliver has ever written.